Fieldwork in archaeology has been transformed over the past three decades. Drawing on a wealth of experience in excavating some of the most complex, deeply-stratified sites in Britain, Steve Roskams describes the changes that have taken place in the theory and practice of excavation. He then provides a clear account of contemporary techniques, covering pre-excavation reconnaissance and site evaluation, the preparations for full excavation, the actual process of excavation, and the recording of photographic, spatial, stratigraphic and physical evidence. 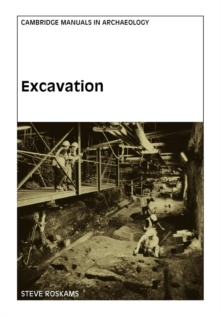 A final chapter discusses the future of excavation. This manual will be welcomed by the professional excavator, the academic researcher, students, and the interested amateur.